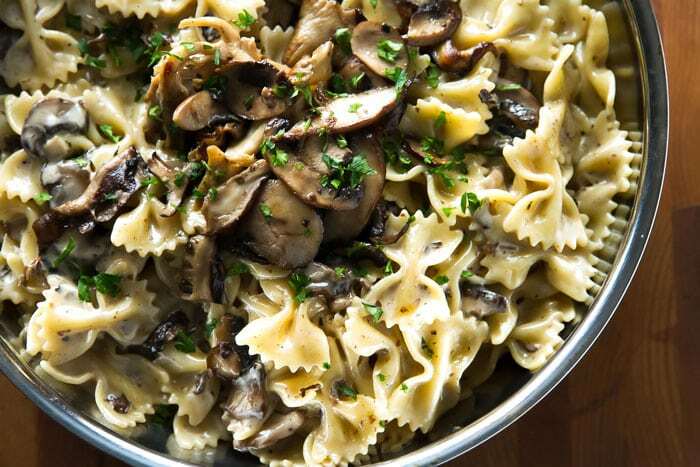 This creamy mushroom pasta takes only 30 minutes – it’s a great weekday dinner idea. 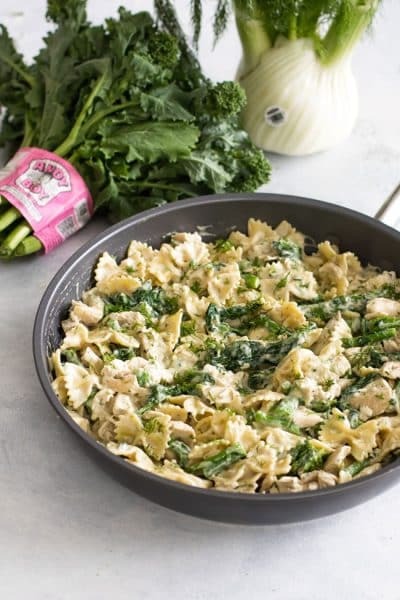 One of the things I love most about Fall (yes, according to the meteorological calendar, technically September 1st is the start of Fall ) are comforting, warm pasta dishes, so I’m kicking off September with a dish that takes just 30 minutes to make using simple, everyday ingredients. 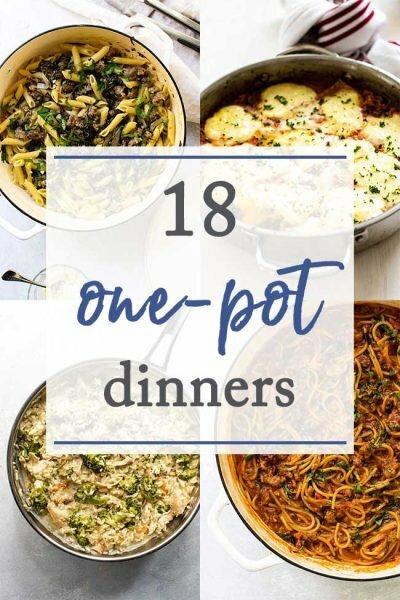 We can all use more go-to dinner ideas that help us tackle the suppertime conundrum – friends coming for dinner? 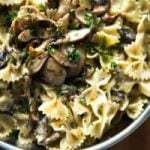 Make this creamy mushroom pasta! 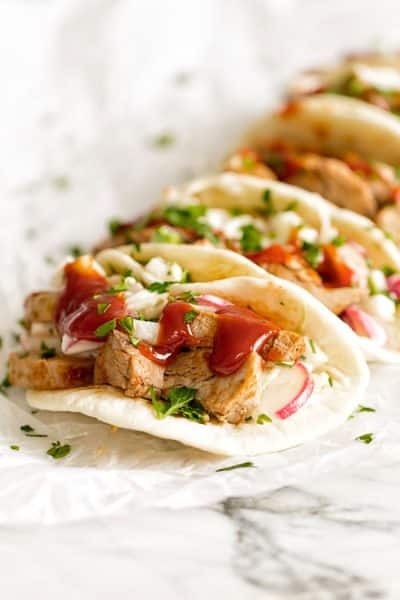 Need a weeknight 30-minute meal solution? This creamy mushroom pasta is the answer! Special occasion supper? Give this creamy mushroo… okay, I think you get the idea. Can we talk about pre-sliced mushrooms for a minute? I used to turn my nose up at “convenience” produce with the opinion that it’s always better to slice and dice your own ingredients. While this may be the case for some things (for example, I always peel and chop my own garlic and I don’t buy pre-grated parmesan), I’ve come around to using some short-cuts and mushrooms are one of them. Yes, yes, I know they cost more, but during the week I’m okay with paying a little extra to catch a break. We work hard! We deserve some pre-sliced mushrooms! I shamelessly used a couple packages of mixed mushrooms, but any kind of mushroom will work – even the non-sliced ones. You start by browning the mushrooms in some olive oil. As they cook you’ll notice some browned bits sticking to the bottom of the pan – this is good news! Once you add the butter, cream, and parmesan cheese (three of my most favorite things in life) you’ll scrape up all of that tasty stuff off the bottom of the pan to create a creamy, rich, mushroom-infused sauce that you then toss with some hot pasta. When you taste the final result you’ll be amazed that it only took 30 minutes, so be sure to pour yourself a glass of wine to celebrate – that’s what I always do. 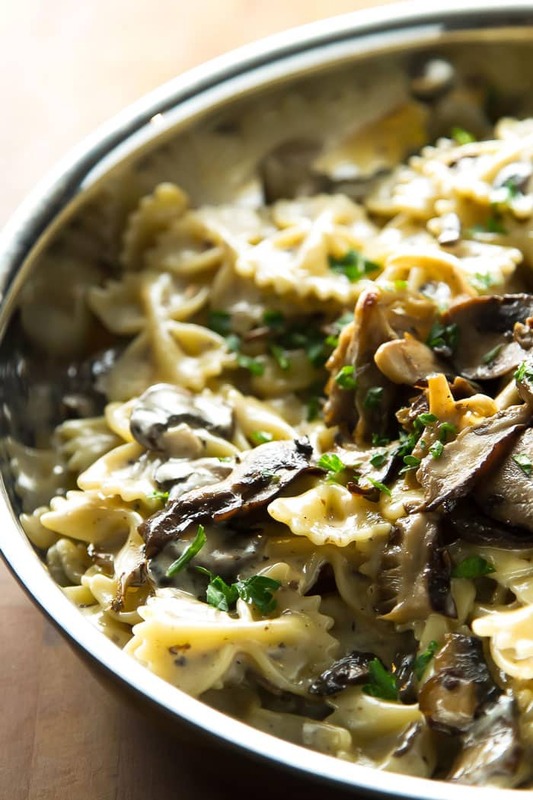 So, three cheers for Fall and creamy mushroom pasta! It’s a wonderful dish to start the season and one that I’ll be making again and again (and again!). This rich and creamy mushroom pasta only takes 30 minutes to make – it’s easy enough for weeknight dinners, but totally “guest-worthy”, too! 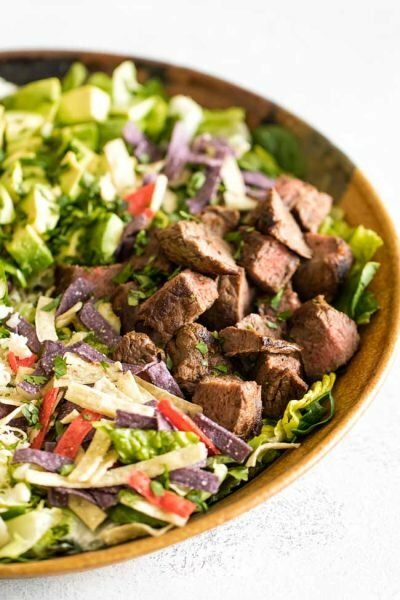 Serve it with a fresh green salad, garlic bread, and a bottle of white wine. Bring a large pot of water to a boil over high heat. Add the pasta and cook according to package instructions (reserve about 1/4 cup of the starchy cooking water). As the pasta is boiling, heat the olive oil in a large pan over medium heat. Add the mushrooms and let them brown, stirring occasionally for about 3-5 minutes. Don’t worry if they stick a little to the bottom of the pan – you will be using all those browned bits in a few minutes! Season the mushrooms with 1/2 teaspoon of salt and the black pepper. Once the mushrooms have browned, add the butter and stir it around until it has melted and is coating the mushrooms. Add the cream and, using a wooden spoon, scrape all of the browned bits off the bottom of the pan. Bring the cream to a simmer and let everything cook for a minute or two. Add the cooked pasta to the cream mixture and stir it all together. Add the parmesan cheese and keep stirring until the the sauce thickens. If needed, add a small amount (up to 1/4 cup, but not all at once!) of the starchy cooking water to help thicken the sauce. Garnish the pasta with the chopped parsley and parmesan cheese and serve. 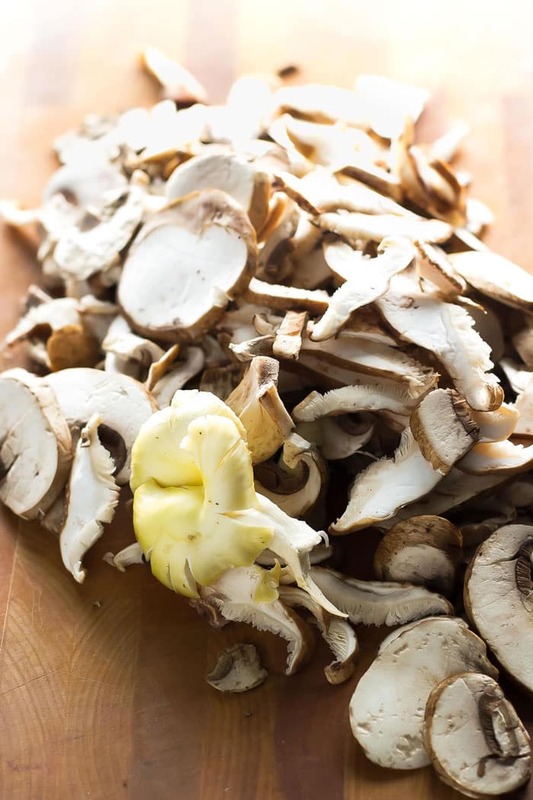 I will defently try these out ,are brown champignons great for these recipe,,how woud it taste by ading one clove of garlick and a little white wine us final touch probally even better or. I have to admit that I’m not a fan of mushrooms, but my hubby is looking over my shoulder at this recipe and drooling. 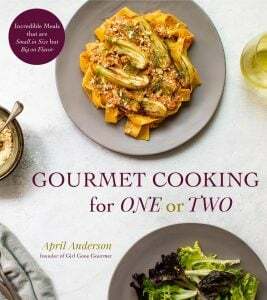 I may make the supper a two-fer and make your 5 Ingredient Sun Dried Tomato Pasta for myself! Oh, I’m swooning! 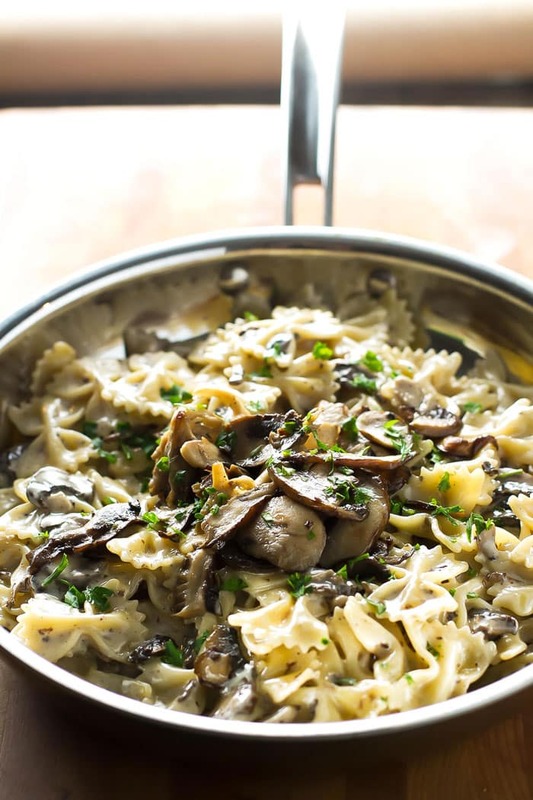 I adore mushrooms—but paired with pasta in a creamy sauce is heavenly!! Haha, guilty I buy pre sliced too, ok and sometimes pre grated parm. This sounds amazing can’t wait to try it. 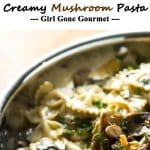 I love it, pasta and mushrooms are a match made in heaven, I don’t usually do creamy sauces but will have to give this a try! Let me know how you like it, Brian! April I love this dish. We are pasta fans. This recipe shouts at me to make it. Can’t wait to give it a try! 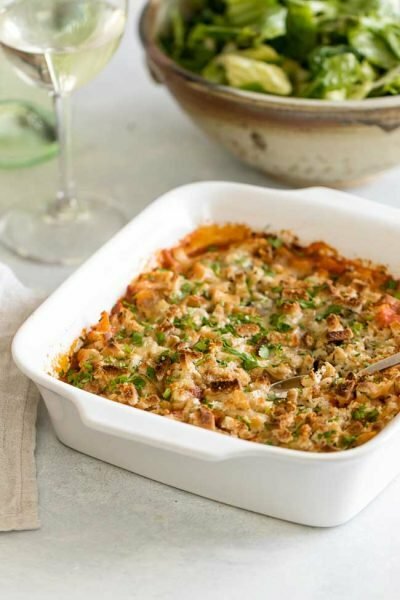 This looks like a pasta dish that my husband would really enjoy! He loves any pasta dish, especially with the addition of mushrooms. I am a fan of sliced mushrooms too. Sometimes the minutes saved really counts. This dish is scrumptious—pasta, mushrooms, cream, and Parmesan is a formula for a great meal!